Loris and Franco had quite a few adventures together. One of the greatest stories about them occurred in and around performances of Turandot. 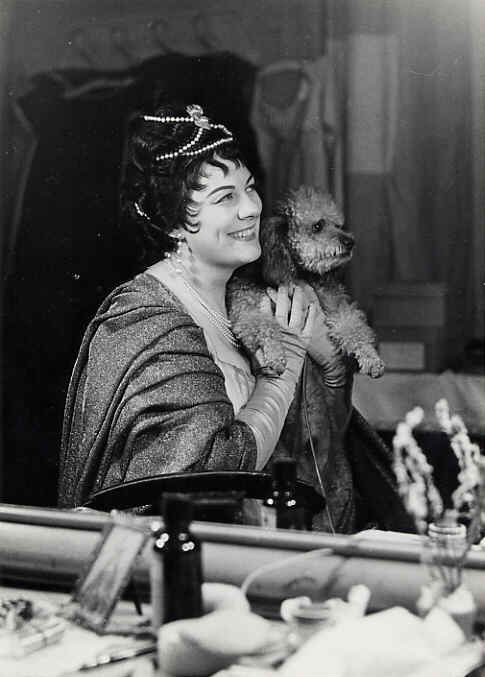 In 1961, while the Met was on tour in Chicago, Corelli’s dog fell very ill on the night before a performance of Turandot. Loris had seizures that were cured by a veterinarian, but she ended up hemorrhaging early the next morning. Corelli had to sing Calaf that same day. He insisted on canceling, but Rudolf Bing told him there was no backing out. Digging in his heels to avoid going on stage, Corelli repeatedly told those around him that he could not go on; he was too distraught to sing. 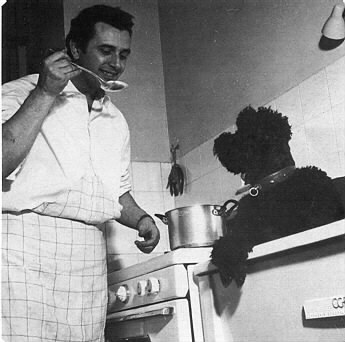 Finally, his manager Merle Hubbard gave him some encouraging words by saying, “Franco, canto per il cane”, (Sing for the dog! ), to which Corelli responded, “Provo!” (I’ll try). With those words, he sang that night. The next city on the Met’s tour was Detroit, and Corelli was sent there ahead of the rest of the company. He refused to leave the Detroit train station once they arrived before he spoke to Loris on the phone. Yes, you read that correctly, he wanted to speak to his dog on the phone. A little whimper from the other end of the line satisfied him, and he continued on with his performances and the tour. (Source: Franco Corelli by Rene Seghers, pages 221-224). Ms. Larmore has owned two furry little friends, however, I do not know if she had them at the same time or separately. In a 2007 interview for the Divas Divulge, while she was singing in a concert with Music of the Baroque conducted by Jane Glover, she posed with her dog Sophie. In the interview, she answered the fun question “If you couldn’t sing what would you do?”, by saying she would be writing a series of children’s books about her dog’s musical adventures. If that response does not evoke Ms. Larmore’s warm and effervescent personality I do not know what does. Sophie also starred, alongside Ms. Larmore, in The Barber of Seville at San Francisco Opera in 1996, acting as Dr. Bartolo’s pet. Initially, when Larmore arrived at the theater, she was told that no dogs were allowed inside, but an exception was made for Sophie by company director Lofti Mansouri. Thus, John del Carlo, singing Dr. Bartolo, carried Sophie around on stage as Larmore sang Rosina. In a more recent 2015 interview, she posed with her adorable dog Buffy, saying in the interview that she was her most prized possession. In the last three days I have devoured and finished Deborah Voigt’s new autobiography Call Me Debbie: True Confessions of a Down-To-Earth Diva. I found her story fascinating, less so from her musical perspective but more so from her struggles with her addictions: Eating, alcohol, and men. Her target audience, I feel, should include not only opera fans, but also those struggling to overcome addictions in general. Through her comparisons between the roles she sang and her own life events, she made both opera and her diseases accessible and easy to understand for readers. I particularly liked her comparison of her own life to Sieglinde, as both of them were forlorn and feeling trapped in the lives they were living; Voigt due to her own physical and emotional constraints, and Sieglinde due to her unhappy marriage to Hunding. If everything in the book is true, it seems as if Voigt did not hold anything back. She goes into gruesome detail about the amounts of food she gorged, leading to her heaviness and embarrassment from events such as the “Little Black Dress” predicament. Nothing is sugarcoated; she puts everything out in the open. Despite some grammatical and factual errors, such as discussing a “Minister” as a character in Götterdämmerung, it remained sincere and authentic. Her sincerity truly touched me the most at the very end. At one point during the time she is in rehab for alcoholism, she describes how she was assigned to draw a Tree of Life, on which she drew her dog Steinway, music notes, and other happy thoughts. She then drew a Tree of Hope, on which she depicted herself as happy and free, which are the exact characteristics she was striving to achieve for herself throughout the entirety of the book. I was left in tears knowing that she was able to pick herself up through drawing after years of suffering. Voigt’s new book truly made me appreciate her journey to becoming and conquering her career as an opera singer. It also made me more thankful than ever that she is still alive on this Earth and benefiting the world of music.